Silverwood Terrace is the almost forgotten name of a row of houses in Albany Street, close to the university campus. Still further lost in history is the large and sprawling wooden home this name came from. Silverwood stood behind the terrace until its demolition in 1923. Percival Clay Neill lived at the original Silverwood from 1872. His posthumous claim to fame is as the great-grandfather of actor Sam Neill, but in his own day he was one of Dunedin’s most successful merchants. Born in Belfast, Ireland, he founded Neill & Company, a firm that imported wines, spirits, and other goods. It later merged with R. Wilson & Co. to become Wilson Neill & Co. Neill was also the French Consul from 1873. In 1877, Neill moved to Chingford, North East Valley. He subdivided the Silverwood property but kept the house as his town residence until 1882, when the solicitor Edward Chetham Strode purchased it. Around this time it was described as a thirteen-room house with ‘pantry, and cellar, stable, loose boxes, coach house, laundry, tool house, fowl house, and cow house. Water laid on to the house, stable, and garden’. It was at Silverwood that Strode died of typhoid fever in 1886, at the age of 34. His wife, Jessie, left for England soon afterwards. 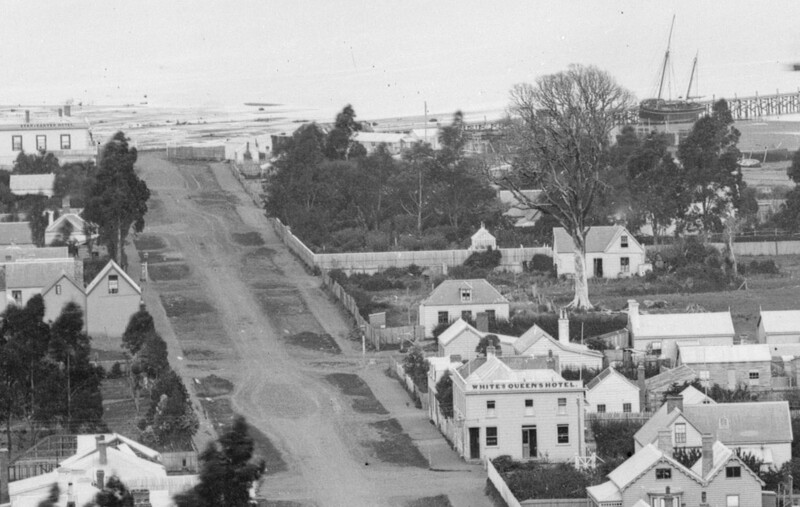 A view from about 1889, looking along Albany Street towards the harbour. The future Silverwood Terrace site is where the trees meet the road on the right-hand side. The old house is obscured. Image: Te Papa C.018395. Detail from Burton Bros photograph. Later occupants of Silverwood included the warehouseman Allan Broad (1841-1930), who was manager of the Mutual Stores and a foundation member of the Hanover Street Baptist Church. He was followed by William Reid (c.1834-1909), a prosperous seed merchant turned florist, resident from about 1890 to 1898. Reid had worked at the Royal Norfolk Nurseries in England and had an international reputation as a collector of native ferns and shrub seeds, which he exported. His daughter, Annie Elsom, followed the same profession and became a successful businesswoman in Christchurch. From 1898, Silverwood was the home of James and Elizabeth Small. Born in Forfar, Scotland, around 1843, James married the slightly older Elizabeth Gall at Dundee in 1873. The following year the couple arrived in Dunedin, where James became a successful building contractor. His first major project was the Dominican Priory in Smith Street, designed by Frank Petre and built between 1876 and 1877. The innovative use of poured concrete in this building is celebrated today, but Small’s contribution remains overlooked. Petre’s call for tenders specified a brick building, and Small submitted the only tender for concrete construction. This was identified as the more cost-effective option, and it seems likely concrete was Petre’s plan from the beginning, with the tenders for brick construction being called to determine an alternative price. Small was the contractor for the Grand Hotel (1882-1883), designed by Louis Boldini. Image: Te Papa O.034103. Burton Bros photographers. The collaboration continued. 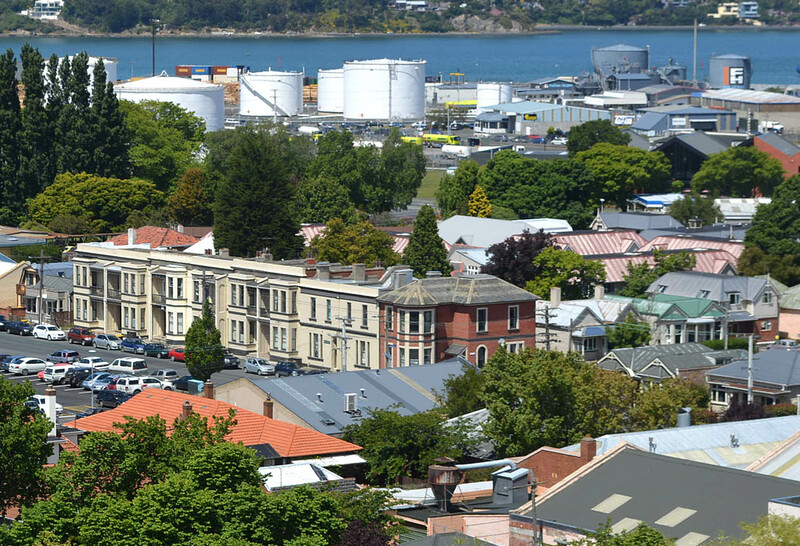 Other buildings designed by Petre and constructed by Small and his team included the Exchange Buildings on Liverpool Street (now Guardian Apartments), the Equitable Insurance buildings (Phoenix House), an office building for the Otago Harbour Board (Donald Reid Building), and the Catholic Basilica in Wellington. Small was the main contractor for three buildings designed by Louis Boldini: the Grand Hotel, Butterworth Bros warehouse, and the AMP Society’s buildings. 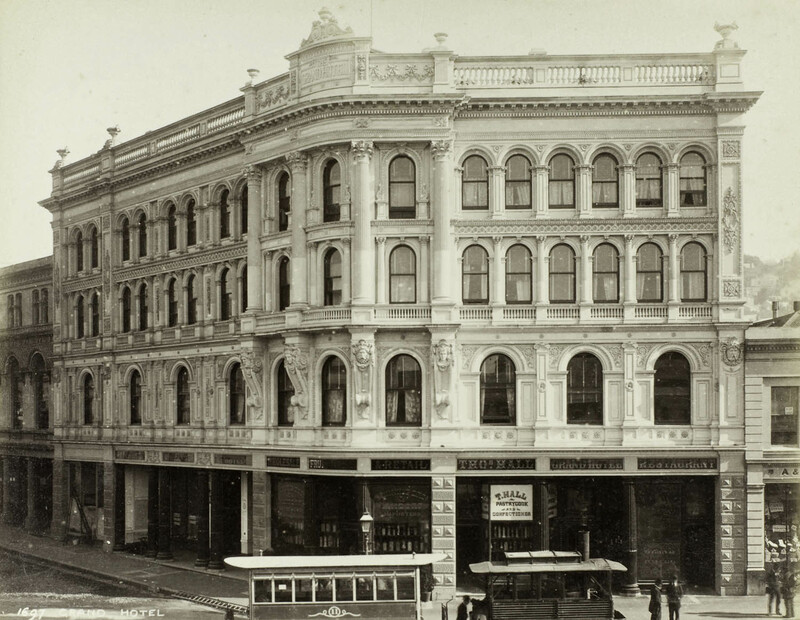 These were among the most impressive commercial buildings of Victorian Dunedin, each with an elaborate four-storey stone facade. They were notable for extensive structural use of iron and concrete, including concrete floors on iron joists. Small built the six Silverwood Terrace houses next to his own home between 1902 and 1904. It is likely he designed them himself, as I have found no record of an architect’s involvement and the surviving plans show only sketchy drafting. 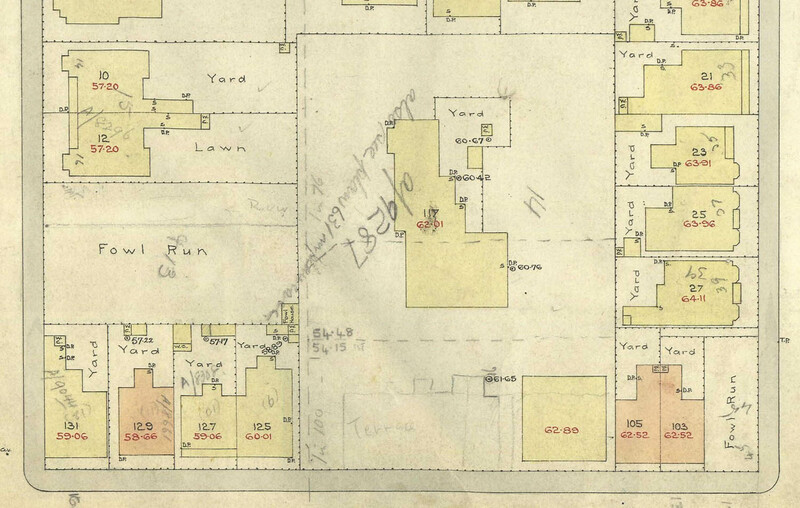 The first building permit, issued in November 1902, was for the two houses closest to Clyde Street. The permit for the middle two houses followed in April 1903, and the final two were approved in November 1903. Detail from a Dunedin Drainage and Sewerage Board plan dated 1905. Albany Street runs across the bottom of the image. The large footprint of Silverwood can be seen at the centre, and the new terrace has only been pencilled in. Image: DCC Archives. 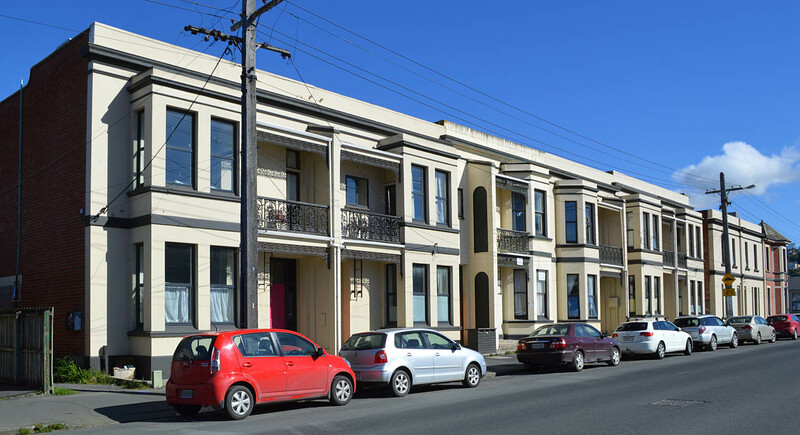 Terraces were not typical of New Zealand housing, but they were relatively numerous in the urbanised environment of central Dunedin. More than twenty historic examples stand in the city today. The earliest dates from the 1870s and the latest from about 1914, by which time public transport and private cars were providing easier access to the suburbs, and blocks of flats were beginning to find favour. Usually built as investment properties or speculative builds, the grandest terraces were handsomely finished for a market that included working professionals and the genteel. At the other end of the spectrum were rough wooden tenements rented to the poor. Silverwood Terrace, though not among most expensive, is one of the better examples. Built in brick, it has a neatly cemented street front, with exposed brickwork at the back and sides. Its style is plain and unfussy, with simple cornices and other mouldings, and a touch of the Italianate about it. Variations in the design contribute to a pleasing rhythm: the middle two houses have faceted bays grouped together at the centre, while the outer houses have square bays with the balconies grouped together. The overall effect is approximately symmetrical, although the houses at the Clyde Street end are narrower than the rest. 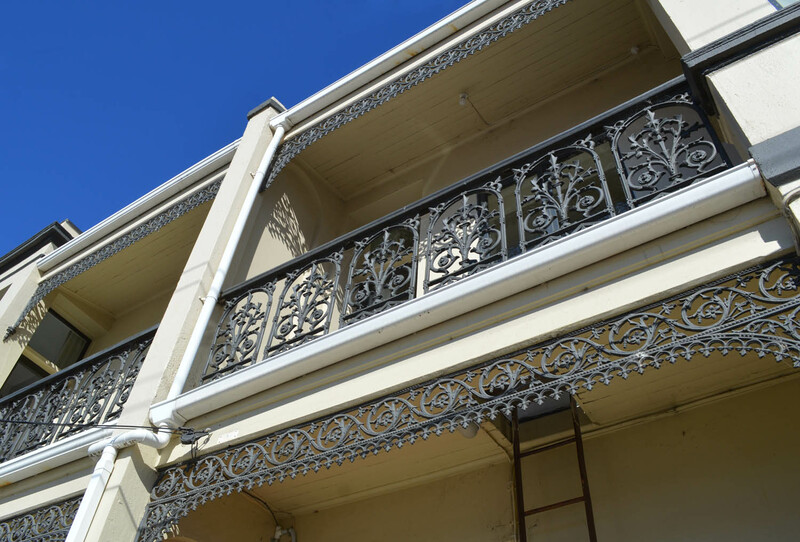 The cast iron balcony railings are excellent examples of their type, and provide the most ornate features. The terrace is sympathetic to the slightly older semi-detached houses next door, which date from about 1896. On the corner of Clyde Street a slightly later house with exposed brickwork, built in 1907, is also in harmony. Each of the Smalls’ houses had a conventional floor plan. The two largest rooms were on the ground floor, with the one facing the street presumably intended as a parlour. A long hallway ran through to a single-storey extension at the rear, housing the kitchen and scullery. Stairs were at the centre and at right angles to the hall, due to the narrowness of the buildings. On the first floor were four bedrooms and a small bathroom. There were five fireplaces in each house. Toilets were in outhouses. The houses remained in the ownership of the Smalls for nearly twenty years, and were sometimes referred to as Small’s Terrace. Neither this nor the Silverwood name appears to have remained in use for long. Street directories give some insight into the backgrounds of the Smalls’ first tenants. The heads of the households were two widows, a mechanical engineer, a storeman, a bootmaker with his own business, and a retired seedsman. Most stayed only a few years, but after her husband’s death Margaret Buchanan remained at no.136 until her passing in 1923, and John and Catherine Mitchell lived at no.140 until 1930. 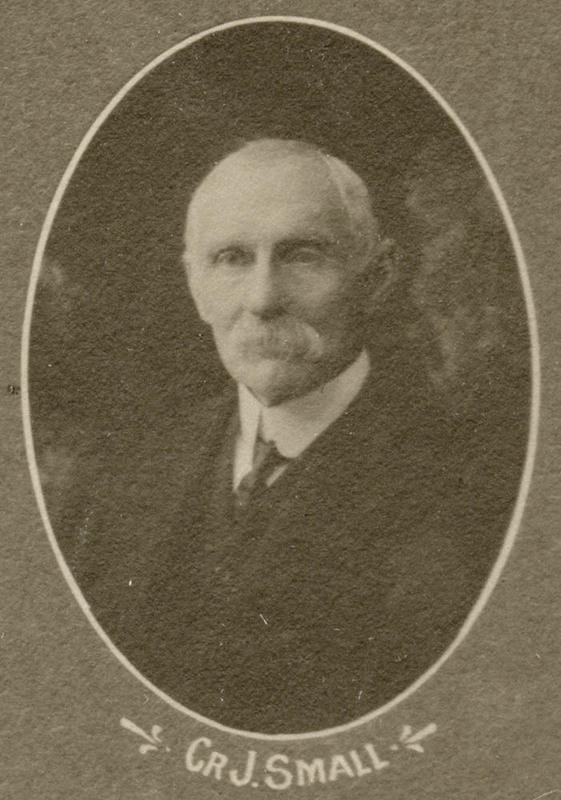 Elected to the Dunedin City Council in 1905, James Small served as a councillor for thirteen years, as Chairman of the finance committee, and as an elected member of the Dunedin Drainage Board. He died at Silverwood on 3 March 1919, aged 75. The following day the flag of the Grand Hotel flew at half-mast, as a mark of respect to its builder. Obituaries describe Small as an unassuming, unostentatious, and capable man, who ‘worked hard and keenly in his own quiet way for the good of Dunedin as a whole’. The Silverwood Terrace houses went to auction in 1925. Notices described them as being of superior construction, and no.134 as a ‘splendid double-storey brick residence, containing 7 commodious rooms, bathroom, hot and cold water, washhouse, copper and tubs, and conveniences; handsome appearance; freehold section’. The main outward change in recent years has been the replacement of wood-framed sash windows with aluminium framed ones, but the original style and glass remains on one of the houses. A uniform colour scheme helps to show off the architecture. The houses are now student flats, and according to the Dunedin Flat Names Project, no.138 has been known as both ‘Wards Manor’ and ‘Mope on in’. Perhaps the old name ‘Silverwood’ might again become familiar. Otago Daily Times 2 February 1872 p.2 (birth of Neill’s daughter), 5 November 1874 p.1 (reference to house as ‘Silverwood’), 16 March 1897 p.4 (Reid’s advertisement), 4 March 1919 p.6 (James Small obituary), 6 March 1919 p.5 (appreciation of Small); Evening Star 10 January 1873 p.2 (Mrs Neill’s advertisement),), 27 February 1878 p.3 (subdivision), 2 March 1882 p.3 (sale of Silverwood), 15 March 1886 p.3 (Mrs Strode), 27 February 1906 p.5 (reference to Small’s Terrace), 18 October 1909 p.4 (death of William Reid), 4 March 1919 p.6 (James Small obituary), 6 March 1919 p.5 (appreciation of James Small), 10 March 1919 p.6 (tribute to Small), 23 July 1923 p.8 (Elizabeth Small obituary), 4 September 1923 p.6 (demolition of Silverwood), 5 September 1925 p.24 (sale of properties), 23 April 1930 p.7 (Allan Broad obituary); Lyttelton Times 6 January 1886 p.4 (Strode obituary); Otago Witness 28 December 1920 p.53 (correction). This entry was posted in Buildings and tagged 1870s, 1900s, Albany Street, Elizabeth Small, James Small, P.C. Neill, Terraces, William Reid on 24 December 2017 by David Murray.